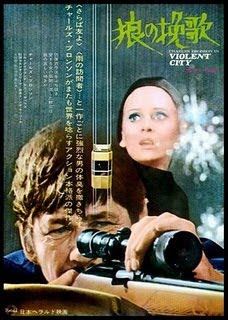 This week the Alamo Drafthouse’s “Weird Wednesday” series screened Violent City (1970) with Charles Bronson. The film was made just before Dirty Harry (and all of the knock offs that followed), setting one of a few precedents for the violent crime thrillers of the 1970s. Director Sergio Sollima and Lina Wertmuller collaborated on the script’s re-writes (it was brought to Sollima by the studio in a nuts and bolts version), adding some Euro-art sensibilities missing from many exploitation films of the period. Bronson’s Jeff Heston is a trained assassin constantly being double crossed by everyone in both his personal and professional life, a plot that takes more than a few drags from Out of the Past’s smoking cigarette. However, the film uses the revenging criminal motif, as well as Bronson’s typical stoicism, to explore more deeply the lifestyle of an assassin.